Instant Pot Creamy Mushroom Curry and Pilaf is a whole Indian meal made at the same time. 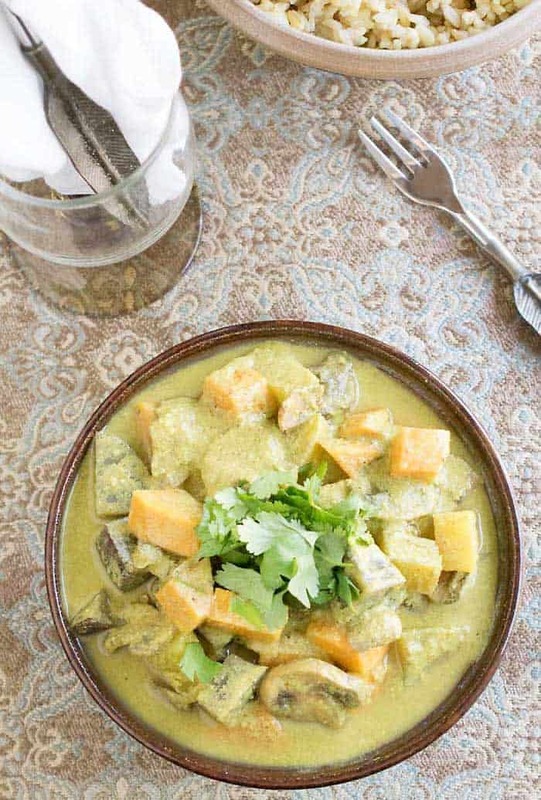 The creamy mushroom and veggie mild curry is served over some subtly spiced basmati rice. It’s a great weeknight meal! 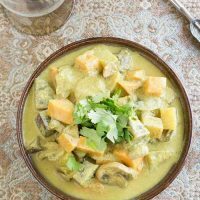 In this post I’m sharing a recipe from Vegan Cookbook for Your Instant Pot, for one of my favorite quick and easy meals – Vegan Instant Pot Creamy Mushroom Curry and Pilaf. I love so many things about my Instant Pot, but cooking more than one thing at a time is one of my favorites. This recipe is great to start with since you can use a Pyrex or oven-safe ceramic dish you already have on top of the rack that came with your Instant Pot. What Is the Pot in Pot Method? You may have cooked multiple recipes at once in your Instant Pot. 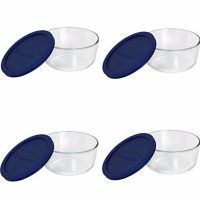 All you do is use separate smaller pot(s) in your Instant Pot liner. One way is to put one or more pans on top of the rack that came with your IP. 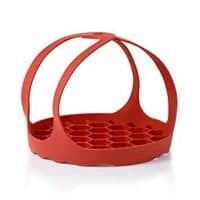 I like to use my favorite OXO bakeware sling instead of the metal rack. It also makes getting other pots out of your Instant Pot liner easier. Be sure that any pans you buy are for the size electric pressure cooker you have. Anytime you use the pressure cooker function you need water at the bottom to bring the pot up to pressure. So in this recipe we’re going to cook the pilaf right in the liner, or the stainless steel pot. In the bottom we cook the brown rice pilaf, and on top of that, in an oven-safe dish, we cook the curry. The rice takes longer to cook, but by putting the curry in a pot, it slows the cooking so the are both done at the same time. For the rice pilaf, combine the rice, water, cardamom pod, cinnamon stick, cumin seeds, turmeric and salt in your Instant Pot insert. 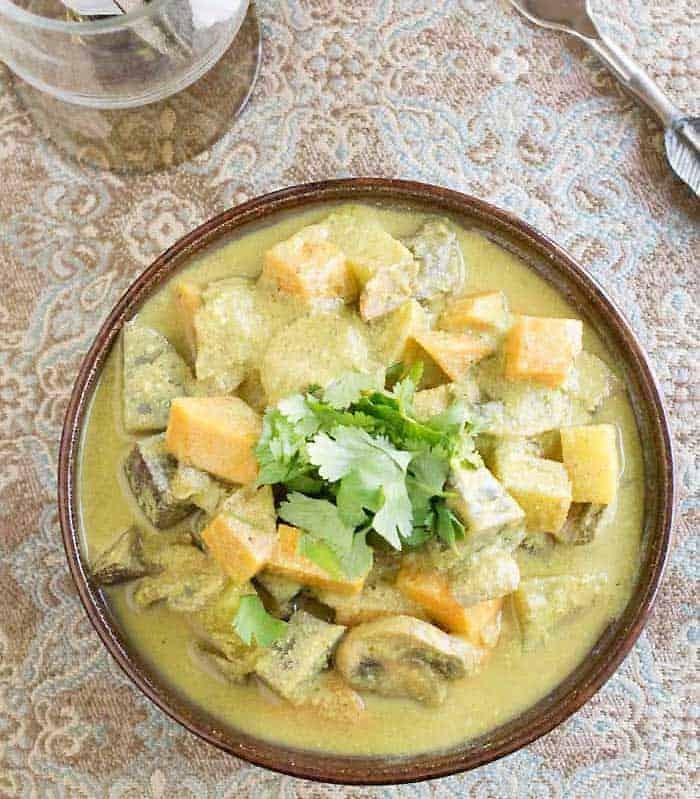 For the mushroom curry, get a Pyrex dish that fits into your Instant Pot, then mix the mushrooms, potatoes, milk, yogurt, ginger, garlic, salt, garam masala, turmeric, coriander and chili powder in it. Cover with foil. Note: If your pan does not fit inside the rack handles, you will need to fashion some handles out of aluminum foil to lower the pan into the cooker. Tear off two pieces of foil about 3 feet (1 m) long, fold each one lengthwise two times. Lay the foil handles out on the counter in a plus sign near your cooker. 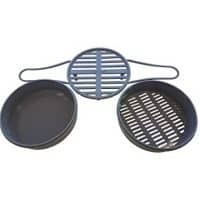 Place your pan in the center, where the two pieces cross. Pull the handles up and carefully lift the pan and set it and the foil handles into your Instant Pot. Cook on high pressure for 27 minutes. Let the pressure release naturally. Remove and discard the cardamom pod and cinnamon stick from the rice.